A few weeks ago, after having my hair done at Hairworks Abu Dhabi, me and my officemate decided to grab ourselves a late dinner. We saw Mugg and Bean on the same floor where Hairworks is and after telling me how good their food is I can't actually wait for my salon session to be over. LoL! 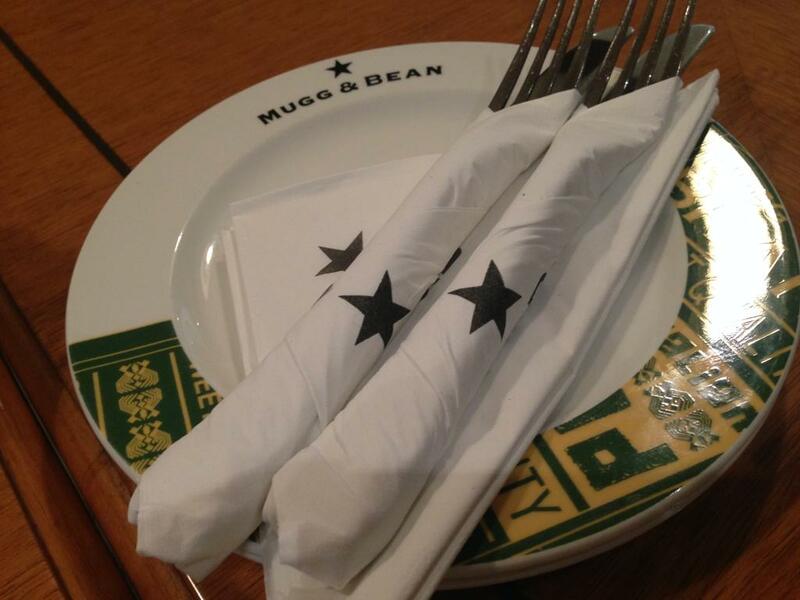 After the salon, we went directly to Mugg and Bean. We asked the server what time they close and she said 10pm. It was around 9:40pm that time and so I asked her if it's okay. She said "Yes" so we got ourselves seated and checked their menu. I find their plates a bit small for a restaurant which serves comfort food but what the heck, I don't mind really as long as the food is really good. I can always refill my plate anyways, right!? 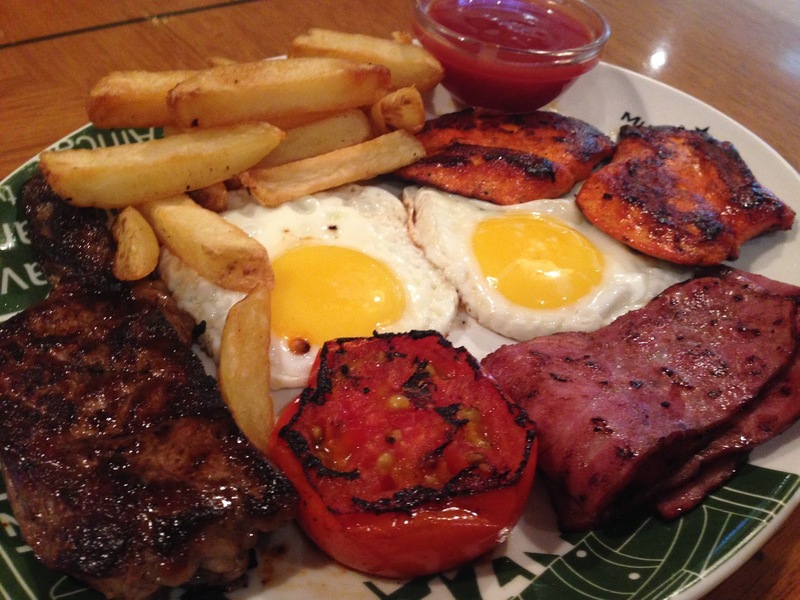 I'm not sure what this is actually called, but I think this is a breakfast sampler. We had a hard time choosing our drinks and though I wanted to give their famous milkshakes a try, I decided to have it for another day just because I felt too much calories at night isn't right. Hahahaa! Kidding. I wasn't just in the mood for sweets. We got ourselves two small bottled water instead. The food was good, and really filling! Each plate is enough for two people, not unless you are so hungry. 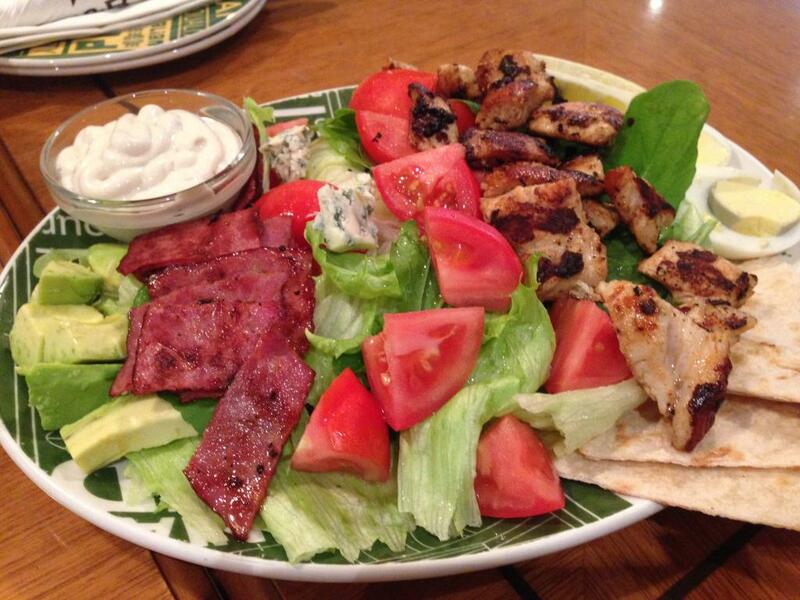 The salad may look so simple but I was surprised that it does have a lot of flavor in it. Perhaps the dressing did the trick? Also, 'twas the first time I had avocados in a salad. I was not a fan of avocados actually, until I had it in this salad. Since then, I always try to have some avocados when I'm preparing salads. But, I wish avocados here are more tasteful like what we have in PH. I do see a lot of avocados coming from different countries in the grocery but I don't have an idea which one of them is better. Hmm, if you do know which, please let me know. And yes, they were talking just beside our table! I am 100% sure they are making parinig! I pretended not to hear them because I didn't want my officemate to react but I told her that we better get going. We were still finishing our food when Server 1 started turning off the lights. She first started with the kitchen, then in some parts of the restaurant. Then after doing so, she again stood beside our table. Probably her way of saying "Aren't you going to leave yet!?" That finally got me mad because it's just so wrong! I've been to a lot of restaurants where yes, they are already closed but they won't make parinig or turn the lights off when there are still customers inside. I was really pissed off! I wonder if they would do the same thing if it were the locals who were left finishing their coffee. Pag kapwa pinoy pwede bastusin, ganun ba? Okay, probably she really needed to go. But hello, does she really need to be rude!? She asked if she can already give us the bill even before our order came and fine, I said yes. Probably they needed to close the register even before 10, but I don't think it's mandatory to be literally closed and with everything turned off by 10! Nakakainit ng ulo. I initially wanted to call her out for it but I decided not to na lang. My officemate reminded me na sayang lang ang ganda ng hairstyle ko if magagalit ako. LoL! So we just left. I always give a tip when we eat in restaurants but not that night. Not to that woman who's so bastos. Kabayan pa naman. 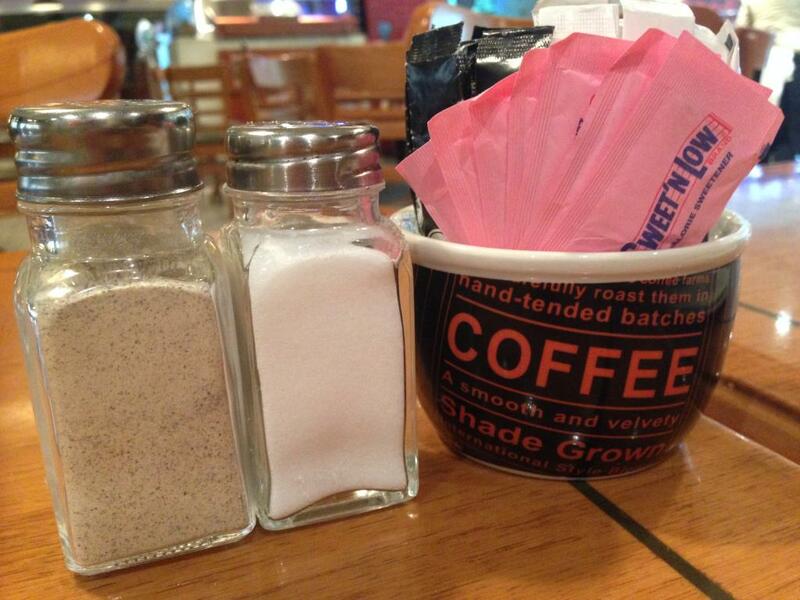 Oh well…so because of that incident, I will never set foot at Mugg and Bean again. Not ever…in that branch! Good thing they have a branch in Al Wahda mall, so I might try going there soon because I heard they have a lot of good food to offer in their menu. And yes, I need to give their milkshakes a try! Hopefully, they don't have a bastos server in that branch..or in any of their other branches. Because if they do, I don't think I'd be willing to let it go next time. These people need to learn their lesson. What's really insulting is that the fact that she did it to her fellow Filipinos. I'm pretty sure she'd be left with no choice but to wait (even if it takes forever!) if it were the other customers of different nationality. Kakabadtrip ka ate, I hope you won't get to learn your lesson the hard way. Baka next time, patulan ka na and your rudeness may cause you your job. Baka rare case, Jheng. Kasi Filipinos are usually nice diba and most of the time kapag fellow Filipino, special treatment nga e.. Sorry that you had that experience. I probably won't go back to Mugg & Bean bc the last two times I got really sick. I was in the Mushriff Branch. The food was OK but getting sick; um, I think I'll pass. She should have approached you guys in a better way, talking to you politely would do her more good. Mug and Bean should start giving customer handling training to them otherwise even if it is a rare case, kasiraan pa rin un ng establishment na pinagtratrabahuhan nila.